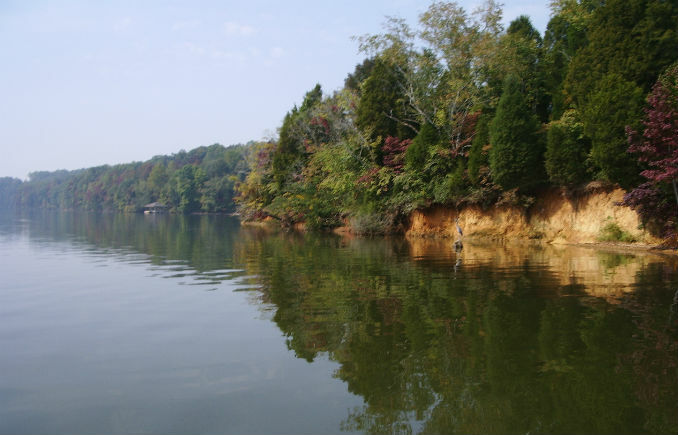 Watts Bar Lake Homes provide 722 miles of shoreline and over 39,090 acres of water surface. In addition to forming a navigable 72.4-mile-long reservoir on the Tennessee River, Watts Bar also creates a slack-water channel for navigation more than 20 miles up the Clinch River and 12 miles up its tributary, the Emory. Watts Bar Dam is 112 feet high and stretches 2,960 feet across the Tennessee River. Watts Bar has one 60- by 360-foot lock that lifts and lowers barges as much as 70 feet from one reservoir to the next. There are 7 major lakes surrounding Knoxville. These are Cherokee, Douglas, Fort Loudoun, Melton Hill, Norris, Tellico and Watts Bar Lakes. Melton Hill Lake is the smallest. This lake fluctuates day-to-day. It maintains water level consistently throughout the year. Norris, Douglas and Cherokee Lakes are reservoir lakes. The water level varies the most on these lakes. Fort Loudoun, Watts Bar and Tellico vary 4 to 7 feet. These six lakes are lowered in the winter months, generally from mid-November to mid-April. Most folks feel it’s too cold to go out on the lake in those months. Personally, I feel year round view is important, not year round water. (It really is too cold on the water!) But that is just my opinion. For more information on lake levels, visit the TVA website – Reservoir Information, select the lake you are interested in and check the Operating Guides.